Before I say anything else, I want to say a big THANK YOU to those of you who shared your wonderful comments on my last post. And the one before that... and the one before that... I've been receiving such warm and cheering feedback from friends not only here, but on Twitter, Facebook, and via email. It was quite lovely to hear from so many of you. For me, that is the joy of blogging... connecting with the hearts of kindred spirits and sharing the simple pleasures we treasure. 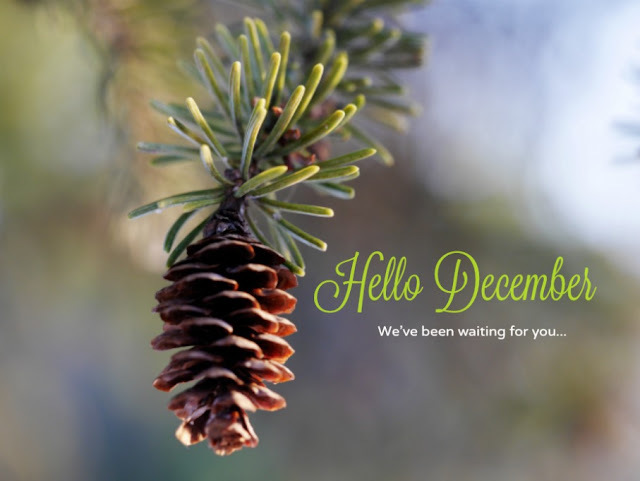 It's hard to believe that we are welcoming December once again. With fog hanging in the air and prospects of snow from the weatherman, it's finally starting to feel more like winter around here. Not that I'm complaining about the milder temperatures, but we are happy to welcome the frostier, nippier degrees -- it's just not the same sipping mulled cider or thinking about Christmas shopping when it still feels like a mild autumn day. I've always enjoyed that old Bing Crosby song "I'm Dreaming of A White Christmas". As a child growing up in northerly Alberta, Canada, there was never any chance of it ever being anything but a white Christmas. 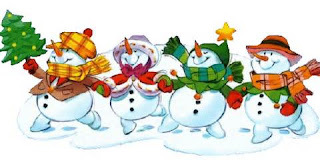 I couldn't even imagine a Christmas without snow, but in more recent years, with temperatures warmer than they used to be, well, sometimes, like Bing, we too have to dream and cast hopeful eyes skyward to watch for snow flurries come December. Early this morning I read my very first Christmas post of the season. Written by my lovely Facebook friend, Sandra, she told of a cherished childhood memory about how her mom would start off this magical month each year. It was a delightful post and I thought you might enjoy it too; you'll find the link here. Sandra's mom often used the phrase "Scatter joy" in her conversations, and it would seem that Sandra has taken up that inspiring challenge, for both her blog and Facebook pages are like vases filled with joy drops waiting to be spilled out and scattered afield.
. . . S C A T T E R J O Y . . . Whether our own pocketbooks have little or much to spend on spreading Christmas cheer from gifts purchased in department stores and online venues, thankfully, we all have the same opportunity to scatter the essence of those two little words, through our own utterances and deeds, thereby scattering a warm measure of cheer and joy to those who need it. 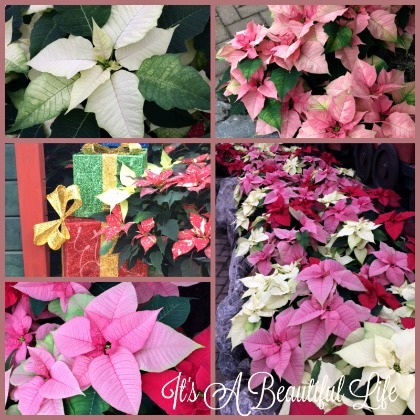 My hubby and I celebrated our wedding anniversary a few days ago, and we visited our local conservatory just days before to take in their pretty Christmas display of poinsettias. Reminded us of our wedding day -- for eighteen years earlier we had our wedding photos taken in that very conservatory, and yes as you catch a glimpse, it was filled with poinsettias that day too. Sorry it's blurry -- scanner isn't working so it's a pic of a pic -- didn't think you'd mind. The little ones are my nephew and niece, now both in their twenties. 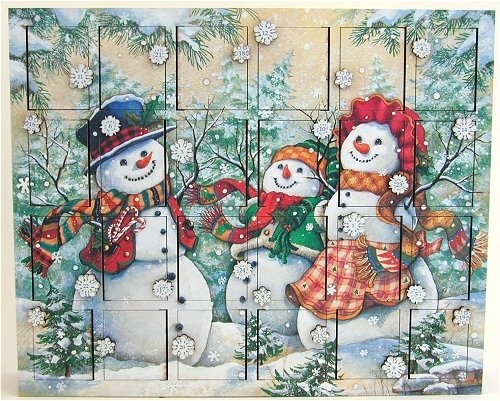 Since the official countdown to Christmas begins today, I'm sharing the link to the Advent series I did a couple of years ago, now also available as a free PDF download ... in case some of our newer readers and friends haven't seen it before, or perhaps you'd like a browse through it again. Interesting little thing, even though I wrote these little entries and so know all about them, their messages still make me smile and bring me cheer all over again. Hope they will for you too. and quiet patience as we await this beautiful Advent season. 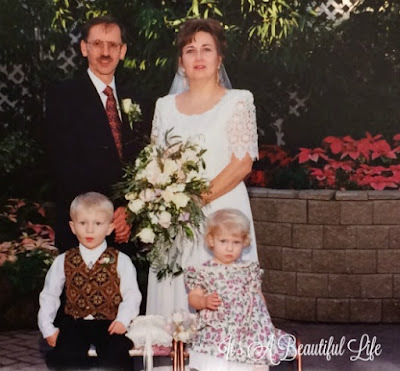 Happy Anniversary you two beautiful people over here at It's a Beautiful Life! You're looking better than ever! I like that phrase "scatter joy" though I don't recall having heard it before. Emerson sure had a way with words. Happy Christmas season to you. Hello Brenda! Oh my gosh, I just opened my email and saw where you have shared your LOVELY blog with me. I was enthralled as soon as I read the first few lines. 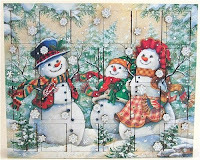 I have already bookmarked your wonderful advent countdown and have read Day 1. 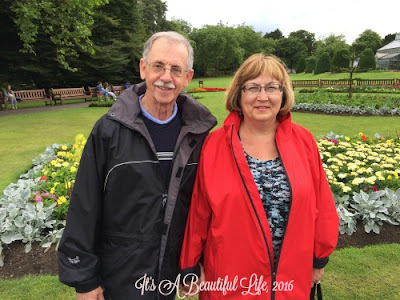 I have never met you in blog land but I am so glad you shared your uplifting site with me! Thank you and I am looking forward to following you. Blessings of the season to you! How wonderful to be blessed with a good marriage. I am thankful for mine too. And I appreciate the 'scatter joy'...I'm going to write that in my journal tonight! Happy holidays! Happy Anniversary, you two! You looked so happy on your wedding day, and just as happy or happier in the more recent photo. You do scatter joy with your words, Brenda. I always love visiting your blog. Now I'm off to download that Advent calendar! Thank you. Lovely photos! And equally lovely words. Thank you Brenda. The pictures of your wedding are beautiful! I think wedding pictures are so fun to look at. The all the different styles are wonderful. Hard to believe it's December already! The year has simply flown by, as have your 18 years of wedded happiness. Love the then-and-now pictures! Happy Advent season! Dear Bren: I saved this until this morning when I had time to read. Which is what I always do with your post. They are always so uplifting and inspiring and your writing is lovely. I so enjoyed your wedding photos and send you all the best wishes for many more years of shared happiness. I sincerely thank you for mentioning me and my column in your post. I consider it a high compliment coming from you. Wishing you and your family the most beautiful Christmas and the very best of health and happiness in the New year! Happy Anniversary, dear Brenda! It was so nice to see the then and now photos, you look so lovely in both. Dear Brenda congratulations on your eighteenth anniversary. Such a delight to see your wedding photos as well as the two of you now. One is truly blessed when they find a soul mate in this life. Hope you enjoy many more anniversaries. Hugs! What a lovely post Brenda. Thank you for sharing your photos with us and congrats on your anniversary.